This is the first ever design that I have learned to do. I've seen something like this at one of the stall in the office "tiangge" at the Head Office. I wanted to make the same so I practiced and had damaged quite a lot of materials but in the end I was able to make one and a more pretty than the one I saw. 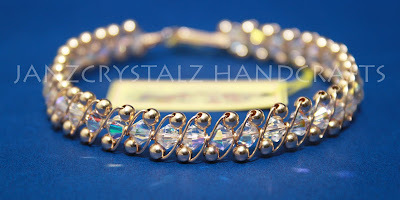 This is a bangle bracelet using white crystal bicone swarovski crystals, wrapped in 14/20 gold filled ball spacer and 14/20 gold wire. Melow Yellow at my page,have a great week ahead!